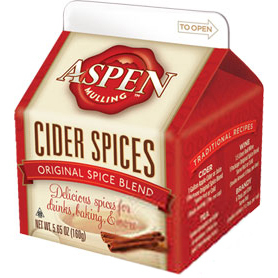 Brand: Aspen Mulling Company BRC-12345 Units: 5.65 oz. carton Mix entire carton with one gallon of apple cider, unsweetened tea, or juice. Or, mix carton with 1.5 liters of red wine. Seasonal Item- available during the fall and while supplies last. Mix entire carton with one gallon of apple cider, unsweetened tea, or juice. Or, mix carton with 1.5 liters of red wine.